Since it’s summer, we’ve been asked to print Beach themed Party Cards using our Fun Digital Calligraphy. 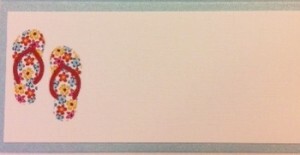 This includes printing the motifs, printed calligraphy on the place cards, table numbers and menus. 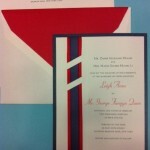 We also layered the cards on high quality stationery and colorful stock to create the final products. Here is the custom calligraphy we printed working with Robert Fountain’s Design team for a Bay Area Beach themed Party! These Custom Calligraphy Place Cards, Calligraphy Table Numbers and Calligraphy Menus are fun & quirky, perfect for a beach party! 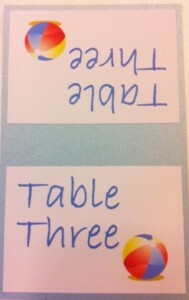 These layered place cards are fun because of the light blue backing and light colored layer on top. The colorful “beach sandals” make for an inviting, casual place card. 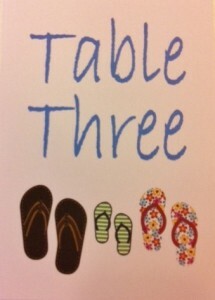 The above Calligraphy is an example of our calligraphy used on Table Number Cards for “His & Hers” and the little ones sandals: these adorable Sandal Table Cards are too cute and way too fun! Check out these Super Cool Calligraphy Menu Cards with Beach-Themed Motifs art work designed by the Robert Fountain team and printed by us using our Calligraphy Service. 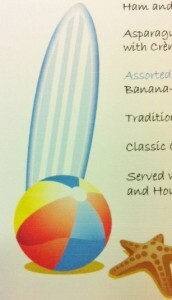 The above example of a “Beach-Themed” Menu Card illustrates the “Surf Board”, “Beach Ball” and “Star Fish” art work with the Calligraphy we printed for the Menu Cards. This is a super friendly and fun design for a Party Menu Card! 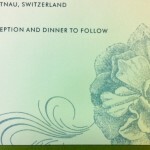 For more menu card and place card designs please visit the Hyegraph Blog. To work on Calligraphy Designs for your next event please Call, email or stop by our San Francisco Store at Three Embarcadero Center.